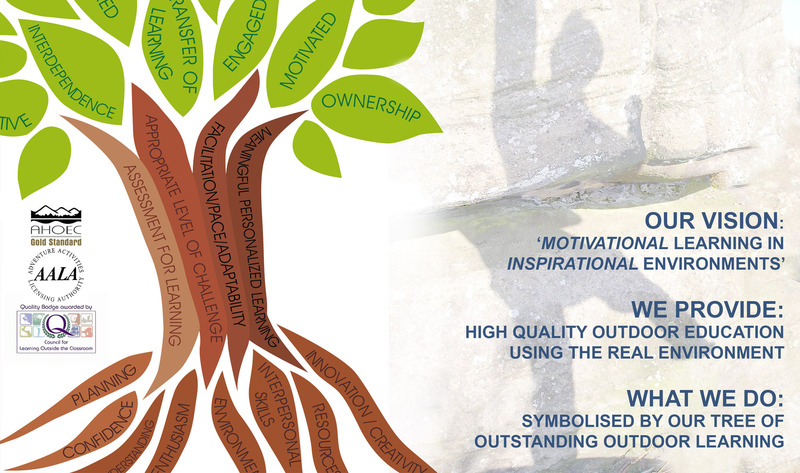 We have developed a model we call the “Tree of Outstanding Outdoor Learning“ to explain our approach. To read about the Tree in more detail just follow this link. Teaching Staff Input (Our qualities, skills and experience that root what we do). Pupils are inspired by their own sense of achievement, the wonderful natural environment surrounding them and by the staff who work with them. They gain new skills, confidence, awareness and potential future lifetime interests. They are engaged and motivated by doing adventurous and challenging activities that take them out of their ‘comfort zone’ and broaden their horizons. There is a recognised transfer of learning between what they learn here and what they have learnt, and will learn, back in school and in their future lives, which they are able to recognise and apply. They learn true interdependence with one another where they need to support each other and work together to succeed. Pupils have ownership of their own learning and are impelled rather than compelled to new challenges and experiences. They have the opportunity to be creative in their learning and are encouraged to think for themselves, make collective decisions, manage risk, understand consequences and recognise their own strengths and weaknesses. Pupils make significant progress during their time here because they are experiencing ‘motivational learning in inspirational environments’. Staff are able to deliver meaningful personalised learning allowing differentiation between pupils of different ability, experience and confidence levels. They use assessment for learning to share clearly identified learning outcomes with their pupils and optimise learning opportunities as they arise. They endeavour to set an appropriate level of challenge and pace and to maximise participation. They use facilitation skills which lead pupils to recognise their own understanding through pertinent questioning. Adaptability is crucial in dealing with changing environmental conditions and pupil needs. The teaching staff at NYOLS are employed because they are able to demonstrate the key qualities, skills and experience required. They have good knowledge and understanding of their subject and good interpersonal skills enabling them to be confident in their ability to teach well. They have a love and enthusiasm for the Outdoors which they are able to impart to their pupils. They show innovation and creativity and effective planning in the way they deliver the programme. They are able to access excellent resources and an outstanding natural local environment in which to work.